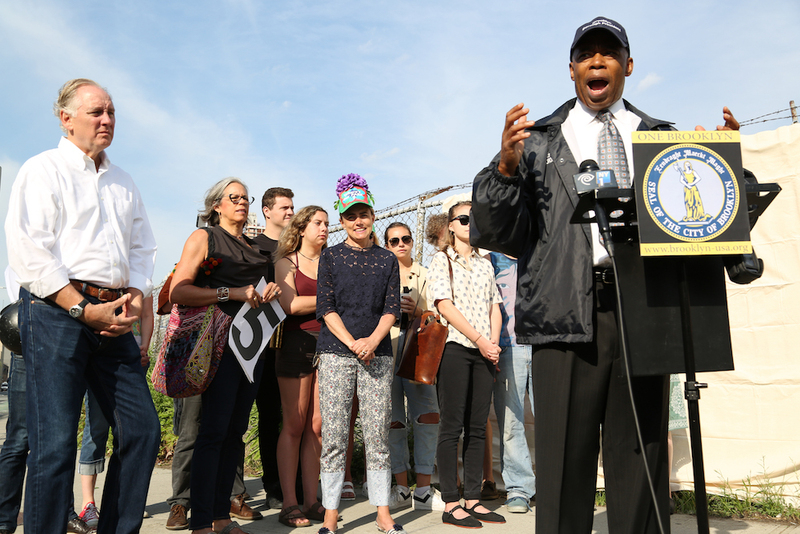 Elected officials and neighborhood activists brought the contest over the long-promised Bushwick Inlet Park to the Greenpoint-Williamsburg waterfront this morning when they publicly posted their ultimatum notice for the developer hanging onto the would-be parkland. 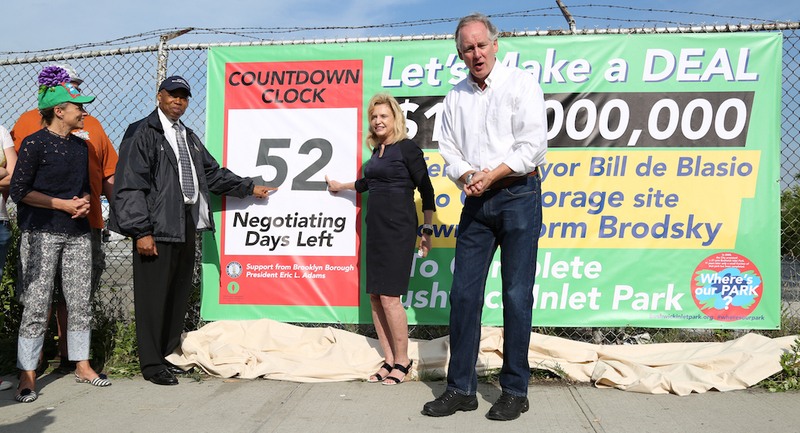 During a press conference on the corner of Kent Avenue and North 14th Street, Congresswoman Carolyn Maloney, Brooklyn Borough President Eric Adams, and members of Friends of Bushwick Inlet Park unveiled a banner featuring a countdown sign with the number of days—currently standing at 52—left on the city’s $100 million offer for the final 11-acre parcel needed to complete the park. The banner, which will be updated every day at 8 a.m. until the deal expires on August 8, calls out Norman Brodsky, the property owner who on Monday rejected the city’s offer for the site. 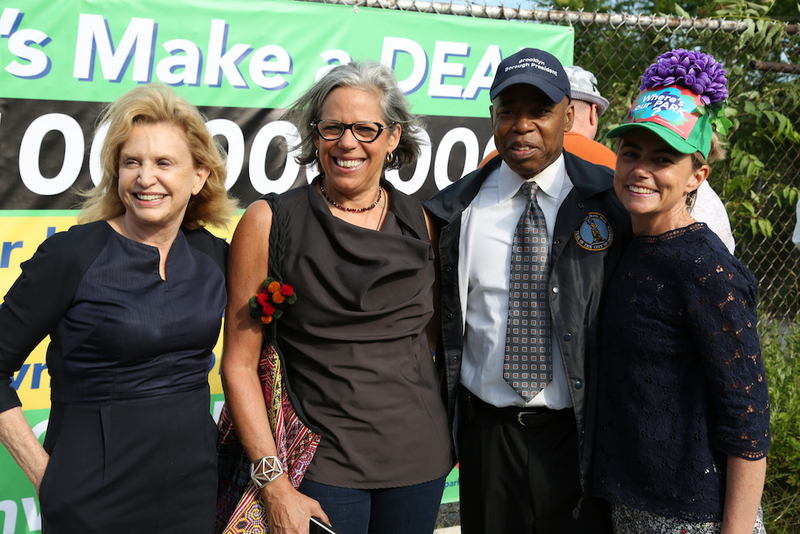 “This will let every resident know that the clock is ticking and we cannot allow time to tick out if we don’t have our park,” Borough President Adams said. If the time does “tick out” before Brodsky accepts, then the next step, said Scott Fraser of the Friends of Bushwick Inlet Park, may involve some seriously drawn-out legal wrangling. “If he doesn’t accept the offer, then at that point we would hope that the city would move immediately to claim eminent domain,” Fraser said. In between chants of “Let’s make a deal,” the group also promised to highlight the negotiation by bringing prominent members of the community to the site every day to put up the new number of days left to negotiate. The 28-acre waterfront park was originally promised to residents as part of a deal that allowed the city to rezone the area in 2005 and squeeze in more luxury buildings near the river. The city bought most of the surrounding land, but balked at the price tag for the remaining stretch belonging to Brodsky. Now, more than ten years after the fact, mayor Bill de Blasio is ready to ante up. So far, the city has spent upwards of $278 million on the land surrounding Brodsky’s, including $53 million in March on a 7-acre piece. With this $100 million offer, the city is hoping to finally build the park it promised. But, as Fraser pointed out, that’s just the beginning. Once they have the land, it’s going to take a lot of time and money to turn the former site of an oil refinery into a park. The banner hangs in front perhaps the ugliest piece of the land: a greasy, weed-ridden parking lot that’s within spitting distance of the Superfund cleanup site around nearby Newtown Creek. Just past the lot is Citistorage, the warehouse that, along with an apartment belonging to Brodsky, burned up last year, reigniting the community’s interest in transforming the area into a park. Brodsky did not respond to an email sent yesterday seeking comment. Paul Massey, the real estate agent at Cushman and Wakefield who is handling the property also did not return a phone call made yesterday seeking comment. Earlier this week, however, Massey, speaking on behalf of Brodsky, told Brooklyn Paper that they wanted more money for the land and already had multiple higher offers on the table. As delighted as they may be, however, Brodsky’s $325 million asking price isn’t exactly in the city’s price range. Fraser added that their estimate put the value of the land between $72 and 92 million. That figure takes into account that the land is not zoned and, if de Blasio has his way, will never be zoned for more lucrative residential use.